One of the Brooklyn Heights buildings formerly owned by the Jehovah’s Witnesses is on its way to becoming a 29-story condo building developed by Silverback Development and designed by HTO Architect, with CetraRuddy working on the interiors. There will be 21 full-floor apartments and one duplex penthouse. Pricing hasn’t been revealed just yet but you can almost bet on it being on the expensive side. 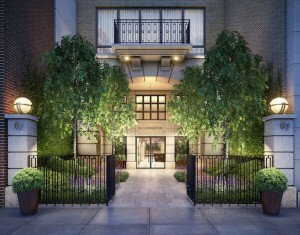 Among the amenities are a doorman, two courtyards, a catering kitchen, wine cellar, and a landscaped roof deck. Sales will launch in April, with Bold New York leading those efforts.